"Blessed is the man that trusts in the LORD, and whose hope the LORD is. For he shall be like a tree planted by the waters, which spreads out its roots by the river, and shall not fear when heat comes; but her leaf shall be green, and will not be anxious in the year of drought﻿ nor will cease from yielding fruit." 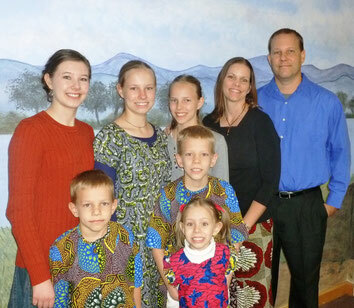 In May of 2007, we moved from Long Island to Nigeria in order to help with the start-up of a Bible School. We came with our 4 children and Cindy was pregnant with our fifth. After 5 months in Port Harcourt at the YWAM campus, we relocated to Aba where the Bible School is located. After completing our commitment in Aba, we continued to serve as missionaries in Nigeria as staff with Youth with a Mission. There we staffed 3 Discipleship Training Schools (DTS), one of which we led. Eric also took a 3-month course of School of Biblical Studies (SBS). Finally, we helped pioneer the first ever (in Nigeria) School of Evangelism (SOE). Now we are embarking on a new and exciting work in Gombe state, Nigeria. Under the leadership of our home church on Long Island, we will be pioneering new ministry in a mostly-rural environment. Our focus will include Evangelism, Discipleship, Family Ministry, Community Development, and Frontier Missions. Before we married in 1993, we knew that God had called us into full-time missions, but we didn't know when or where. As we have progressed through the years as a family, it has been exciting to see the plan of God unfold in our lives. We have tried our best to hear His voice and follow in the steps He has planned for us and prepare ourselves the best we could. We have seen God's faithfulness in our lives as we have attempted to put into practice the principles that Jesus has laid before us. We have celebrated times of victory and have cried through moments of failure. But God has always brought us through! We pray that this website will inform and encourage our family, friends, and any visitors who stumble across these pages.